William Crane, founder and CEO of IndustryStar Solutions LLC, is quietly building an amazing team – and fast growth business – in Ann Arbor. IndustryStar’s innovative Supply Chain as a Service - virtual supply chain team enabled by patent-pending cloud software - lowers staffing costs, provides a variable cost structure as opposed to fixed, and allows companies to instantly scale and ramp down real time. The company’s recent client wins include electric bus OEM Proterra, powertrain Tier I supplier Blackburn, and consumer electronics company Cycleboard. From its offices at SPARK Central, IndustryStar is attracting top tier talent that’s fueling the company’s exponential growth. The access to talent in Ann Arbor allowed Crane to build relationships with both mentors and team members. It’s also helped with recruiting key members of the IndustryStar team. IndustryStar’s co-founder and director of supply chain solutions Tony Lancione chose to relocate from Auburn Hills, MI where he worked at US Farathane, to head up IndustryStar’s growing supply chain services business. Co-founder and supply chain analyst Tyler Davis chose to leave Whirlpool in Findlay, Ohio to join IndustryStar. Davis and IndustryStar’s growing team manage end-to-end supply chain operations for consumer electronics, medical device, automotive, and various IP heavy technology products. Having a talented team working in downtown Ann Arbor is only part of IndustryStar’s success. At the intersection of the Ann Arbor community and entrepreneurial community is Ann Arbor SPARK. 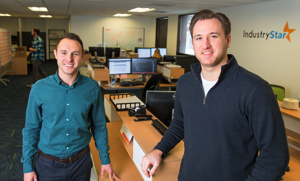 Since starting in the SPARK Central Innovation Center, IndustryStar has rapidly outgrown its initial office to a spacious suite. Crane has words of advice for others who want to emulate IndustryStar’s success.